One platinum art deco necklace. 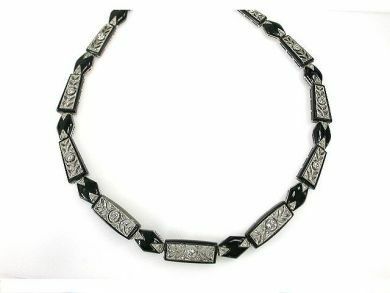 The necklace includes alternating black onyx and dimond floral openwork links and stylized diamond shaped black onyx links. Eleven old European cut diamonds (1.00 carats: VS-SI2 clarity: G-H colour). 152 single and rose cut diamonds (1.10 carats: SI-I1 clarity: H-I colour). The necklace is fifteen and a half inches in length.